In a summer dominated by sequels and comic book movies, Edgar Wright’s latest movie is a breath of fresh air. It’s also his best since Shaun of the Dead in 2004. To say I’m a Wright fan is an understatement. He’s up there with Danny Boyle as one of my favourite Brit directors, though some of Edgar’s movies do go off the boil toward the finale. I was there at the midnight screening of The World’s End and diverted miles out of my way during a 2012 road trip to ensure I could explore the key landmarks in Hot Fuzz. I also watched every episode of Spaced several times over. With ‘Shaun’, he and co-writer Simon Pegg hit the comedy horror nail so squarely on the head, it was up there with An American Werewolf in London and Young Frankenstein as a genre classic. And as much as I adore Hot Fuzz, that third act descended into an OTT shoot ’em up. Scott Pilgrim vs the World peaked half way through, as did The World’s End. Then it looked like Wright’s long cherished Ant-Man would finally see the light of day… but he dropped out. However, his directorial flourishes remained like echoes of what could have been. Which brings us to Baby Driver, the already much acclaimed romantic comedy crime caper with a terrific soundtrack. Anson Elgort is the eponymous hero, a fresh-faced kid with tinnitus who says little but his driving skills speak volumes. He’s ‘Mozart with a go-kart’, as Kevin Spacey remarks at one point. That hybrid of Spaced and Spacey proves a terrific mix. He never gives a bad turn, but here the Old Vic legend gives one of his best performances as the criminal mastermind behind assorted heists. His rock solid performance ensures every time he’s on screen, the movie comes alive. Not that it needs much help. The action scenes are often breathtaking. A street shootout cuts the excess flab from Michael Mann’s landmark Heat, which no doubt inspired it. This is leaner, but thankfully not meaner than that 1995 bum-numbing classic, while the opening BD car chase leaves me with a huge grin for the duration. It feels like after years of shifting through gears, Wright has finally found the right one. While some movie vehicles can have a super car sheen but milk float-style story engines, puttering out long before the end, Baby Driver is a Bugatti Veyron powered by an F14 fighter engine. The stunts, pacing, editing and score are superb, while the chemistry between Elgort and Lily James is priceless. She has the screen presence of a genuine movie star, while solid support comes from Jamie Foxx, Jon Hamm and Jon Bernthal. The sucker punch is Baby’s relationship with his deaf foster father Joseph (the superb CJ Jones). A hugely touching moment in the third act proves more effective than the outstanding action scenes and brilliantly scored iPod-driven other moments (Baby’s opening title coffee run is terrific). One of many genius moves is Wright choosing the original songs of many tunes which later found fame as sampled smashes. So instead of yet another airing of ‘Jump Around’ by House of Pain (see also War Dogs, Whiskey Tango Foxtrot and Bridget Jones’s Baby), we get the pre-HOP original. Great movies are about giving the audience what they think they’re getting, then pulling the rug. 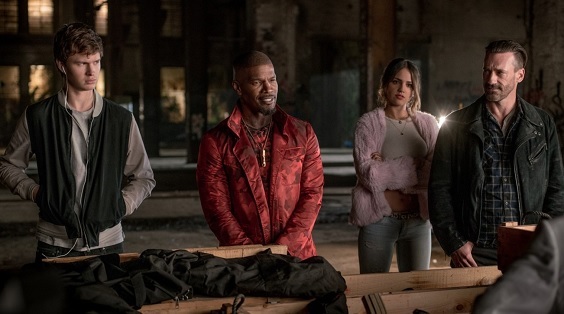 Baby Driver is up there with La La Land as one of my films of the year, and like that riot of colour, action and music, I can’t wait to see the whole thing again.